"I think it's beautiful. I like being in it," says Angela Jennings. "I love the stairs." Comfortable, well assembled space, where even the stairway is remarkable. While not the typical description for a book shrine, Multnomah County's Central Library is just that kind of place. Ms. Jennings' appreciation for the steps leading up through all three floors is shared by many and well deserved: It is a grand staircase with beautifully etched granite steps reaffirming the building as a "garden of knowledge." The Children's Library even features an astounding bronze sculpture of a tree, among other specially designed artwork. It was on her first regular visits that this advocate for "children, the disabled and seniors" first discovered the city's public library and soon came to make it a regular part of her trips before moving to Portland a few years ago from Orange County, Calif. She comes to it even on days when she is overwhelmed or tired, because here she finds comfort and respite from daily life. Serenity is in the very brick and stone of this elegant 1903 Georgian Revival landmark designed by the masterful A. E. Doyle, considered one of the most beautiful buildings in the city. Honoring historians, philosophers, artists and scientists, the exterior walls and benches bear the names of those who continue to shape the Western mind. The towering elms that surround the library also seem to inspire to seek further heights. Inside, large open archways frame the windows, and the ceilings soar. Under a domed skylight on the third floor that helps create the perfect ambience for learning, the lobby plays a dual role as the Collins Gallery, displaying locally relevant literary arts, such as children's writers and illustrators. Sometimes the space also moonlights as a stage for some of the city's most stimulating performers. First and foremost, this is a library. As one of the largest public buildings in Portland, it serves one-fifth of the state's population. Its stately presence, however, does not make it stuffy. In fact, it is loved partly for being accessible and so much more. With all the open space in the three lobbies, the sweeping staircase and impossibly high walls, the library still holds more than 17 miles of shelves, making available approximately 2 million choices to view or borrow, from old newspapers to rare books and DVDs. An extensive renovation finished in 1997 (which included structural, aesthetic and technological updates) redesigned the reading rooms and desks to accommodate laptops and search stations while preserving the staid, craftsman style of the furnishings. Simple chairs gracefully surround sleek flat panel monitors, which in turn rest on desks of similar design. Nearly 500 terminals are available throughout the building to help with various levels of searching, from the in-house databases to uncensored access to the Internet. Information staff on every floor explains and complements the electronic resources. The number of computers in Central Library makes it one of the best places to surf the web and check e-mail for people passing through downtown. While they are there, they can take in an art exhibit, hear a story under the tree in the Children's Library or find the answer to that question about Portland that has been nagging them since last night's walk. Equally important, it plays a vital support role for many people seeking all types of resources. "I always encourage people that I know [who need] everything from social services, to work, to a place to relax, to come find it here," says Ms. Jennings. She empowers people to satisfy their own needs, find their own answers and feed their own minds and souls. She finds it symbolic of the city's spirit of support and cooperation. Citizen involvement is a Portland tradition. In this case, Friends of the Library, a 33-year-old organization, has been instrumental in keeping the library running and its stacks growing with the evolution of media. The first records, film projectors, videos and DVDs as well as the first electronic reference system were all made possible through the advocacy and fund raising by the group. The Friends also run a retail store in the foyer with unique and exquisite gifts and souvenir for book lovers of any age. For a truly rare treat, historians, researchers and bibliophiles can use the John Wilson Special Collections, housed and designed specifically to preserve significant historical materials; its current holdings total more than 10,000 items. These include a perfect copy of Captain Gray's Company (the first book published in Oregon the year it became a state), as well as first editions of Little Women and some of the Oz series. Other treasures include a rare Audubon collection, a rich selection of Native American literature and even autographed photographs of celebrities like piano virtuoso Rachmaninoff. Readers are not the only beneficiaries of Central Library's offerings. Besides the spacious and readily available conference room by the entrance to hold public and grassroots meetings, the building also provides an invaluable space to writers who need access to the system's materials: the Sterling Room. To honor Donald and Adelaide Sterling's own experience in the world of letters (editor and writer, respectively) and their commitment to local emerging writers, this room was set up and funded by Donald Sterling, Jr., to designate a private, quiet space for research and writing, not far from historical and other references. The library system's young reader summer program, Everybody Reads, is a contributing factor to increased academic scores in grade and middle schools, as is Writers in the Schools (WITS) in the middle to high school students by sponsoring workshops for teen-agers with established local writers in all veins of creativity, from playwriting to poetry and memoir. Central Library, the oldest public library west of the Mississippi, is remarkable enough to be inscribed in the National Register of Historical Places. Perhaps more significantly, it is lodged in the hearts of Portland locals and visitors as more than a place to borrow a book. As Ms. Jennings alluded, it is a living source of knowledge. All that and not hard on the eyes, either. 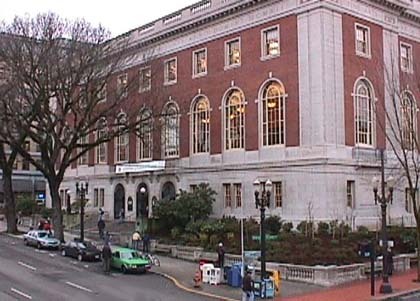 About the Central Library: Multnomah County Library is the oldest public library west of the Mississippi, with a history that reaches back to 1864. Today, Central Library and the 16 libraries that make up the library system house 490 computer search stations for the public and a collection of 2 million books and other library materials. History: What is now the Multnomah County Library dates its existence from 1864, a time when Portland was a frontier town with frame buildings, muddy streets and few sidewalks. A small group of Portland citizens met to establish a subscription library and reading room, organizing under the name "Library Association of Portland." Central Library , located at 801 S.W. 10th in downtown Portland, opened in September 1913. Designed by architect A.E. Doyle, the building took two years to build at a cost of $480,000. The Central Library building, now on the National Register of Historic Places, continues to be the heart of what has become a system of branch libraries that serves library users all over Multnomah County.